Kashgar marked the end of my Chinese Silk Road journey before entering the ‘stans, and a dream destination I had to see soon before it disappeared – the old and original part of town, that is. The old town is where the ethnic Uighur people of Kashgar, in Xinjiang province, reside and where their daily life has unfolded for centuries gone by. Sadly, this now small pocket of colour and life is being replaced by soulless high rises with not much thought to preservation of Kashgar’s rich Silk Road history. I felt honoured to experience the warmth and character of Kashgar, and a different slice of China. 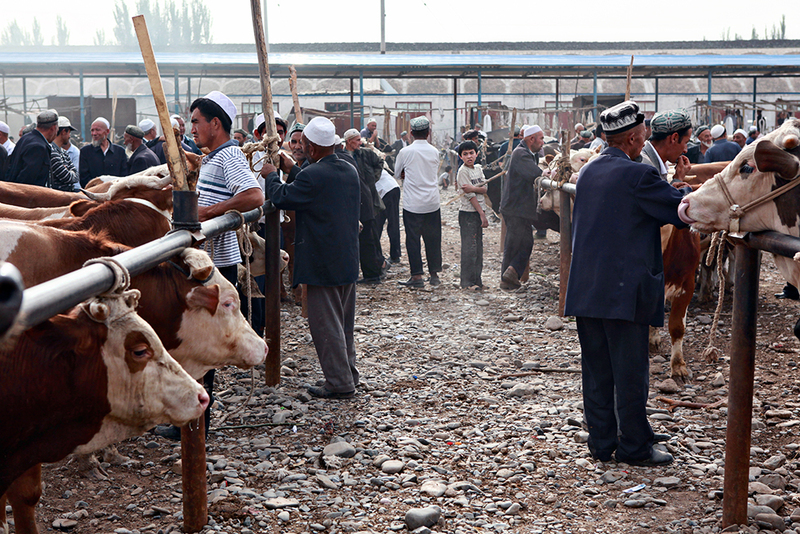 When I remember Kashgar, I recall the people and the greetings exchanged. Upon my arrival, I quickly learned the local greeting “A Salaam Alaykum” to which locals in turn would reply “Alaykum Salaam” with warm, welcoming smiles. It instantly broke any divide and allowed me to capture many memorable portraits. One of my favourites is a shot I took of an older man with a long white beard and a peaceful disposition. With hands on our hearts and gentle bows of the head, we both warmly voiced “Rakhmat” after I photographed his portrait, in thanks. These kind of exchanges, genuine and full, always bring the photos right back to life.